It started as a short story in the collection “20th Century Ghosts,” by Joe Hill. It was interesting because it was a story of revenge. It was the story of a guy who was gifted with the superpower of flight, and what he chose to do with it. It was brilliant in its brevity, really. It showed you the first thing he thought to do when he realized what he had, and honestly, I’d be willing to bet it’s not all that different from what some of us would actually do. Earlier in the year, IDW took the short story and adapted it to the comics medium, and this is the continuation of that. Like all good serial fans, it’s in my nature to wonder “what happens next,” and I want to thank IDW for giving us the opportunity to find out. As this issue shows us, Eric has more dirty work to do to cover up his initial act, and Ciaramella doesn’t skimp on the gore, or the ingenuity of the main character, even if some of the things we see here are indicators that Eric has more than just flight now, somehow. It’s alright, as it furthers the story. Seeing as this is a miniseries, there are threads that are introduced in this story that are not resolved, as you would imagine, and I think the hurdles that Ciaramella is putting in front of Eric are interesting, yet logical ones to use. Zach Howard’s art style is well suited to this book, in that it seems a little bit darker than one might expect, yet still very descriptive, and he even adds in distinctively comic book-like flair to the shadows that makes the whole thing just pop. So between the continuation of an already very interesting story and the art style of Zach Howard, I’d strongly suggest this book. It’s a fun read, and really, who can’t use that? What Brubaker and Andreyko do here is take a look at Bucky’s life before he was introduced to Captain America, where they point out that the two had very different roads to travel, despite being very similar in age. After recent events in Marvel, I wasn’t sure we’d get to see another story with Bucky, but while this isn’t really ideal for that(I wanted more Bucky as Captain America, to be honest.) it does tell one of the most compelling stories I’ve read about either the character or the time period. Elements of Bucky’s home life before putting on his costume are introduced, and while I didn’t know about them before, there is nothing illogical or really out of character to be shown here, and it has me very interested for the next issue. We’re shown Bucky as a troubled youth, helping to take care of his sister after the passing of their mother, we see Bucky struggle with the anger that he has inside of himself, and he deals with the fact that all of his life, he’s been wearing a mask of some sort or another, something everyone is familiar with in one form or another. I’m fine with telling origin or near-origin stories, honestly, but I hope this story arc picks up from here. I would also understand an arc that serves as something of a eulogy, but still, there’s a lot that Brubaker and Andreyko could be doing something with this story than a simple retelling of the life of Bucky Barnes. As for the art, Chris Samnee’s stuff is always impeccable, and there’s definite growth over time with the guy, but even if there wasn’t, I would still pick up this book for his name alone. Good stuff! This issue could serve as a good turning point for Invincible. We’ve seen Mark go up against and defeat some of the baddest bad guys in the universe, but now he’s starting to question his motives. In a show down with Powerplex, he’s starting to realize that it’s not enough to be a reactionary hero anymore. There needs to be something more he can do for the greater good. For Invincible fans, this is symbolizes something very important. First, it mirrors the thoughts of his father, Omni-Man, way back in issue 7 when he tried to take over the world. And secondly, it starts to reconnect Mark with the questionable government operative Cecil Steadman. Invincible has berated Cecil in the past for his methods, but they’re once again starting to share similar motives. 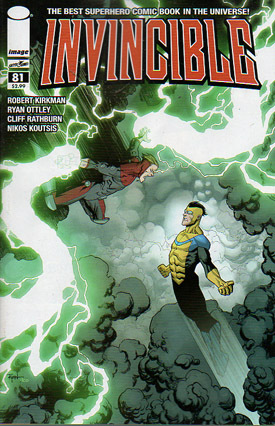 It’s events like this that make Invincible such a great comic book. 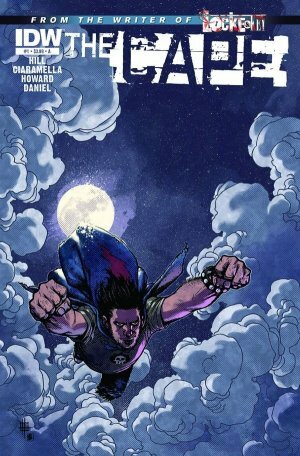 As it is a creator owned series, the characters are actually allowed to grow and develop, instead of staying stagnant. There are numerous points in Invincible continuity that serve as great jumping on places for new readers, and just as many important moments that forever change the character for long time readers. Month to month, this book just continues to impress and as the tag line on the cover reads “The best superhero comic book in the universe!” it’s an absolute wonder why more people aren’t picking up this book. Kirkman’s consistently smart writing, Ottley’s absolutely incredible visuals and some eye-popping colorists, make this one comic book that you should be buying. If you listen to me talk for a solid hour about anything in the comic industry, you’ll probably hear me talk about how much I love the character John Constantine and his title, Hellblazer. You’ll probably hear me say that I have all but a handful of the issues, going back to #1. But something I don’t think I’ve ever mentioned is how, as an early Hellblazer reader, I wanted John Constantine to be a part of the regular DC Universe. I know he’s had romantic entanglements with Zatanna, as they’re both magic users, but the closest he’s come in his own title was his cross over with Sandman, who didn’t really interact with any DC heroes, but Batman and Green Lantern were shown in a panel of the Sandman, so I think it still counts. Anyway, this title brings me what I want, with John Constantine interacting with both Batman and Superman over the course of two issues(Swamp Thing himself doesn’t count; Constantine was introduced in his book), and personally, I couldn’t find it more satisfying. The character behaves pretty much like he should, even if it does seem to be a bit of a departure for him. There are references made to Constantine’s past, even if they are only made in passing, and it would seem that the supers steer clear of him for a reason, namely his reputation. What I love the most, however, is how Batman steers him towards Superman because he thinks John is too dangerous to be let go, and how Superman sees right through his “save the world” speech, telling John that he knows he only wants to save himself. Have I lost you yet? Takeaway here is that if you enjoy Constantine you should be reading this mini. So finally, Spider Island starts. It’s been teased in the back of Spider-Man books for a little while now, and for me, the anticipation has definitely been worth the wait. If you’ve been reading, you know that the Jackal has infected New York City with a species of bed bugs that pass on spider powers when they bite you, and now he’s going around collecting infected people to further his own nefarious purpose, while Spider-Man(sans spider sense still) is being trained by Shang Chi in the art of Kung Fu. Let me start by saying that I have no love for the Jackal. I got into comics around the time of the Clone Saga, and I firmly believe that the only good part of that story was the Scarlet Spider. That said, I love reading about the Jackal and his various Professor Warren clones that he has working for him, and the schemes he’s setting in place for the as-yet-unrevealed shadowy figure behind it all. Honestly, the only thing I’m not entirely thrilled about with the coming story is the idea of adding about 20 titles to my pull list. It’s not that I feel I need all of them to complete the story; I’m sure Slott does a fantastic job keeping it all in the main title, but the Avengers, the Spider-Girl and Spider-Woman, the Deadly Foes, Cloak and Dagger, and Heroes for Hire tie-ins all seem interesting to me. Much like Shadowland was, there are sides to the story that aren’t going to be covered in the main story that I want to know more about. Back to this issue, though. I love how Slott balances everything that’s going on, and gives us a wealth of story, with just about every player in Spider-Man’s life being shown somehow in action, from The Future Foundation to Aunt May. This is definitely my pick for the best book of the week, if not the best book of the year, at least so far. And that will do it for this week! Do you feel we missed something? Do you want to recommend something for next week? Do you just think we got something wrong? Stop by the comments section and let us know, or tell us on Twitter! We’re always willing to talk. Until next time!